My last post offered a news story in 1945 written by a British naval officer remarking on differences between Australian and British beer culture. His account conveyed a sense of amity and warmth between the British and Australian forces. The empathy seemed to apply throughout the war between Britain and its former colonies. This was not alway so not for the (substantial) American forces in Brisbane. In a major riot in 1942, generally called the Battle of Brisbane, Australian and U.S. personnel fought tooth and nail. Many injuries ensued and at least one death, a hardly creditable episode in Allied relations. Indeed it wasn’t the only such incident. Smaller disturbances between the same factions occurred later in Brisbane, and elsewhere in the country. I mention that set-to simply to distinguish it from an October 1940 riot, an intra-Australian matter in this case (America wasn’t in the war yet). The melee is known as the Brisbane Beer Riot or Brisbane Beer Barrage. 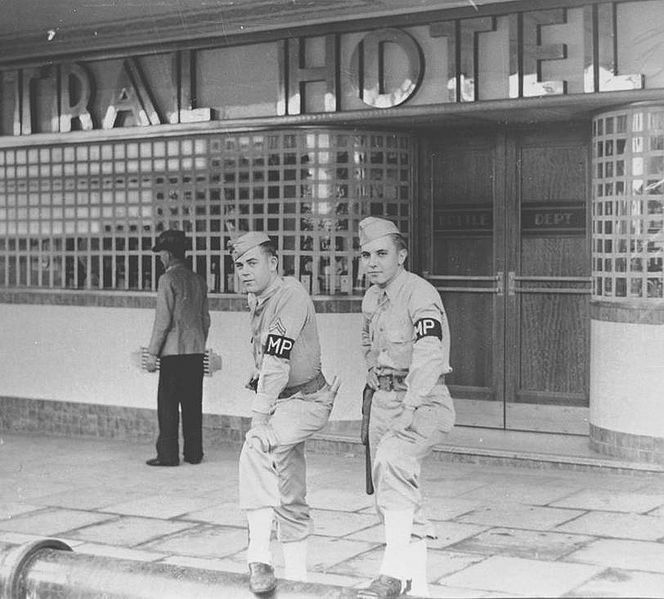 The image above is from a later period when American forces were in town but conveys the atmosphere of a Queensland hotel in the early 1940s. The Brisbane Truth described graphically the Brisbane Beer riot and reasons: not enough beer for the soldiery, or not at the right times. Queensland licensing laws required hotels to close by 8:00 p.m. and to shutter on Sunday. The authorities did not enforce the rules though and a practice developed to keep the hotels in full swing until 11:00 p.m.
With the war going badly and a long struggle in sight there was a clamp-down and finally the law as printed was applied. The soldiers rebelled, taking over part of the downtown and snatching a keg through the smashed windows of a hotel. They rolled it down the city’s Queen Street to the lusty a capella of the song Roll Out The Barrel. The trouble is believed to have originated when the soldiers were ordered out of a Queen street hotel at closing time— 8 o’clock— and was still fermenting three hours later. Military police were called in from the camps to assist the police, but the demonstrators remained out of hand. Complete control over the men was not gained until 2 o’clock this morning. Trouble began in Queen-street shortly after 8 o’clock, when soldiers were removed from the hotel. Fights broke out among the uniformed men. When other uniformed men joined in, the quarrel spread, and soon civilians gathered around the disputants, police came on the run, and hurried calls were sent out for reinforcements of both civilian and military police. Civilian police acted with restraint, and endeavored to calm the men, while officers who were rushed to the city in big military trucks, also added their persuasive efforts, but failed to quieten the men. Officers then went into consultation with the men, and hot arguments ensued, some of the men hooting their superiors, while others cheered. Eventually, some arrangement was apparently reached— there was no chance of any civilian getting near enough to hear the tenor of the conference— and the officer blew his whistle. The men forming up in marching order, and went from Queen-street to Edward-street. The march proceeded as far as Charlotte-street, when somebody suddenly started the cry, “About turn!”. It was taken up by numbers of the men, and soon swelled into a tremendous chorus. Almost as a solid body, the men obeyed the order, turned, and marched back into Queen street, led by a soldier who set the march tune with an accordion, which could scarcely be heard above the din of the shouts, “Roll out the barrel, we want beer!” and the cheering and hooting of the men. By this time, extra pickets had been rushed in from the suburban camps. The march proceeded into George-street, but eventually came back into Queen-street, where amazing scenes developed. The tone of this and other press accounts shows the shock the populace felt at this complete breakdown of morale and discipline. Terms such as “unprecedented” and “sensational” fill the stories. If anything the papers underplayed the gravity of events, due probably to military or self-censorship. Modern historical assessments such as this one give a fuller picture. Note the many interesting photos, including one showing a special dispense system to serve beer without a head, a preoccupation particular to Australia in this period, it seems. Official inquiries followed the debacle. One result was that Australian Imperial Force (A.I.F.) canteens, formerly dry, were henceforth permitted to sell beer until 9:00 p.m. The 8:00 p.m. rule was continued for civilians. This demonstrated to the forces a degree of public solidarity that earlier seemed less than manifest in their view, probably justifiably. In his reverse picture of the English pub and drinking customs in 1943 the Australian Godfrey Blunden wrote that beer was essential to the war effort. The alcohol level was moderate and beer supplies in particular unreliable, but there was enough to go around or so people judged. In Queensland, drink shortages and narrow trading hours were accepted by the population but the soldiers made clear you could only go so far in their regard. I am careful to restrict these remarks to Queensland. 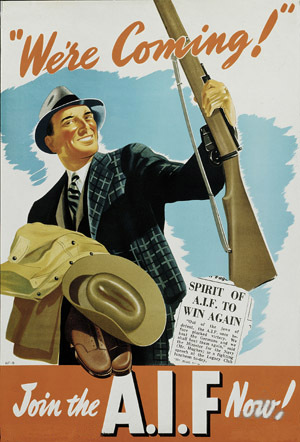 The states in Australia, due to their independent history before federation, had differing laws on breweries and drinking even after the war started. Given the strains of any war, and our Western traditions, a reasonably permissive policy on alcohol seemed necessary, or that is how it was viewed then. Note re images: the image first above is from the Wikipedia account of the Battle of Brisbane linked in the text and the ultimate source is credited therein. The second is from this Wikipedia story on the history of the AIF. Copyright belongs solely to the lawful owners or authorized users. Images are believed available for educational and historical purposes. All feedback welcomed.